Give your living space a tinge of industrial flair with the Magnolia Home Pier & Beam Coffee Table. Boasting a sturdy frame, this home furniture piece is accentuated with a butcher's block rectangular shape that is sure to stand out in any room decor. Two drawers equipped with bar pulls offer a functional element to this contemporary style coffee table that is supported by metal block legs. 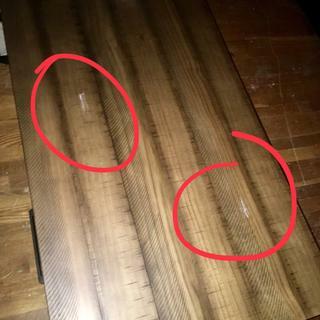 Permanent white markings on furniture. What I thought were scratches are actually design additions of “distressing “. Not overly impressed.